Tortuga uses hardware profiles to manage node registration. For elastigroup a remote hardware profile with permission to control the name-format will be created so that Spotinst can manage VMs. > update-hardware-profile --name elastigroup --name-format "*"
The first command will launch an editor with the queue name configured. Save this template. The second command will associate the @elastigroup hostgroup with the queue. All clusters must be uniquely identified with a Spotinst Account. To do this set SGE_CLUSTER_NAME during the install of the Spotinst Controller. Retain this value, which will be used again when creating the Elastigroup. 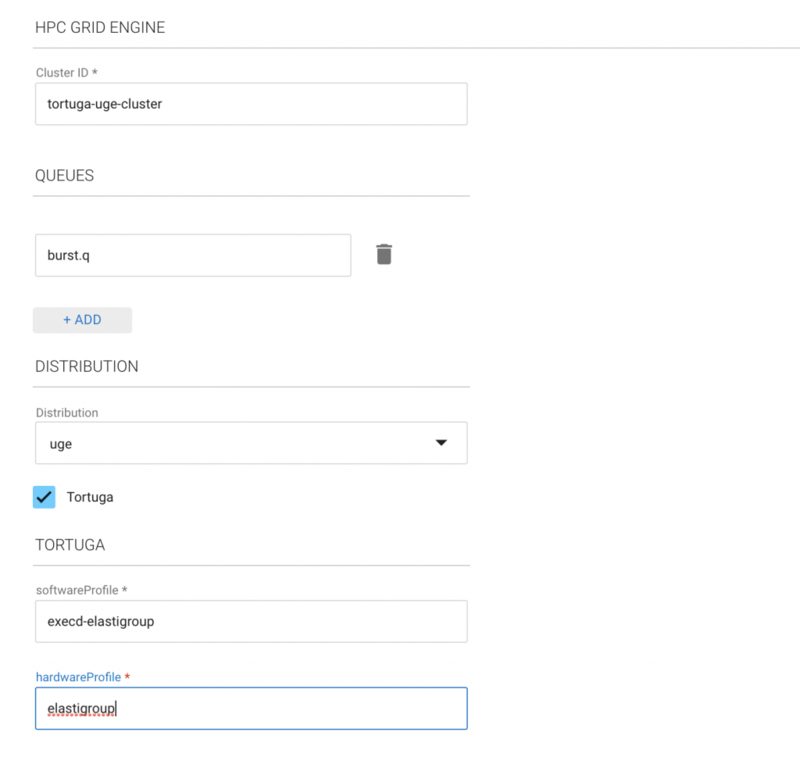 When creating a Spotinst Elastigroup there are a few properties that must be set for nodes to register with Tortuga and the Grid Engine master. The following are recommended settings that are compatible with most UGE installations. At least 1 instance is required so that jobs can be submitted to a queue. dns_nameservers installerIpAddress Where the Tortuga DNS server is installed. Defaults to the value set for installerIpAddress.